I didn't really grow up in a football house. The first time I watched a game was when my hometown Eagles were in the championship, and only because my gym teacher painted his sneakers green did I realize it was a really big deal. He'd have to buy new sneakers if they lost, after all! So, while I'm more invested in the results of the Australian Open (go Nole!) this weekend than the Big Game, I love any reason to celebrate with food. 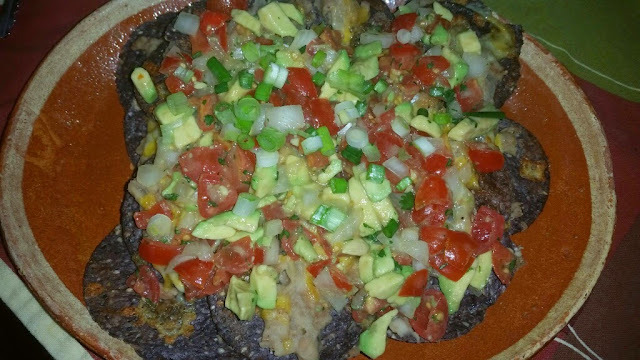 My aunt and uncle in Arizona introduced us to delicious nachos made with lots of layers of goodness when we visited them, and I've made my own versions since developing food sensitivities. What better indulgence to make before or during the long game? The art of making good nachos is in the layering. If you just put a pile of chips on a plate with a bunch of toppings, you'll have some yummy stuff on top of a bunch of dry chips. Kind of a let-down. Instead, put one layer of chips on a baking sheet (or in a 9"x13" baking pan with sides) and top with refried beans and cheese. Top with another layer of chips, more beans and cheese. Melt the cheese in the oven or the broiler, and then top it all with a delicious pico de gallo (fresh salsa) and maybe some sour cream and scallions. You'll get some toppings on every bite. Of course, you can add seasoned beef or chicken to each layer of beans if you like. You can buy all of these parts, or make your own beans and salsa as below. For a special occasion, it's worth the time IMHO. 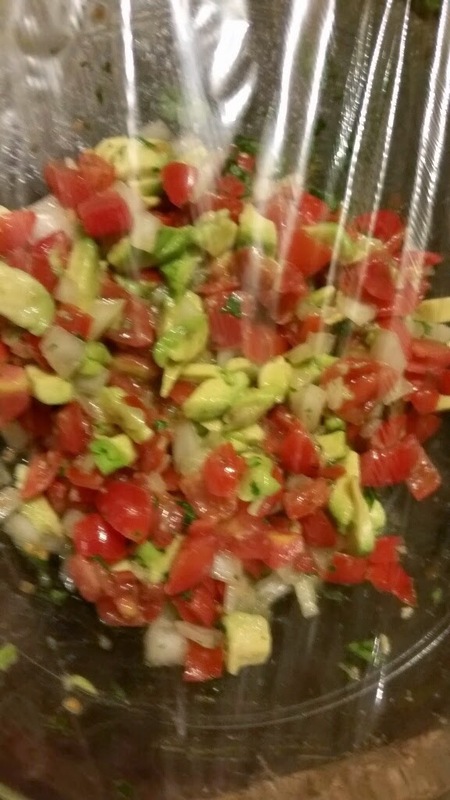 Start by making the Pico de Gallo so it has time to come together. 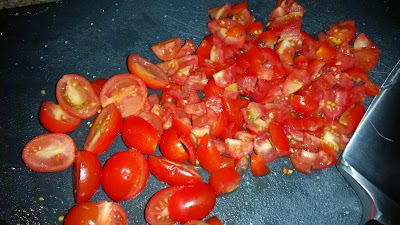 Halve and then finely dice 1 pound of tomatoes. I know, it's winter. Find some hothouse tomatoes when they're out of season, or use cherry tomatoes. They're usually colorful and flavorful even at this time of year. Sprinkle 1/4 tsp fine salt on the tomatoes. 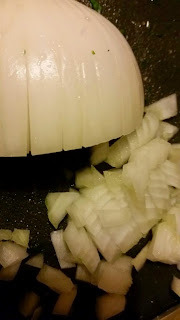 Cut 1 small onion or 1/3 large white onion into pieces the same size or smaller than the tomatoes. 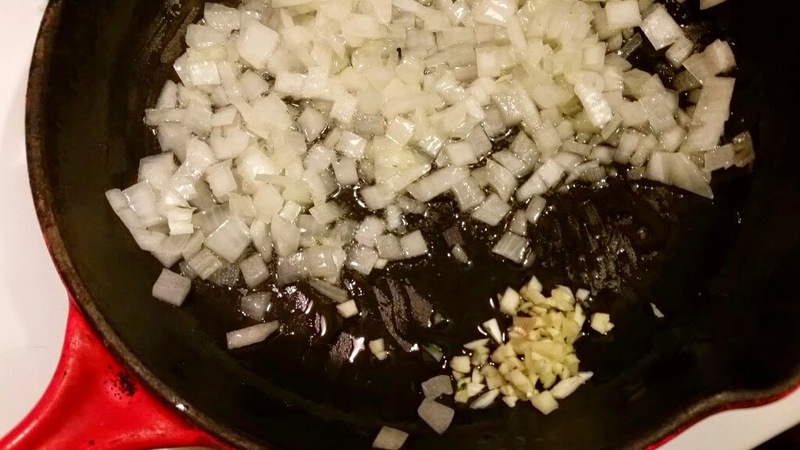 If you can't find white, use red onion, or yellow in a pinch. Mix into the tomatoes. 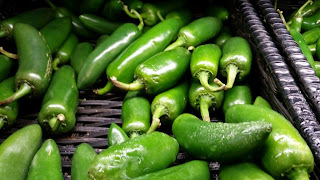 I can't add red/green/yellow peppers to my food due to an allergy, but I took this photo for you at the market in case you're so inclined. And 'cause I'm loving the camera on my phone. If you use peppers, remove the stems, white bits and seeds of 1 or 2 jalapenos and cut them the same size as the tomatoes and onions. Add to the bowl. Next up is the most controversial ingredient: 1/4 cup of minced cilantro. When I first moved to California, I couldn't figure out what was wrong with the Mexican food here. 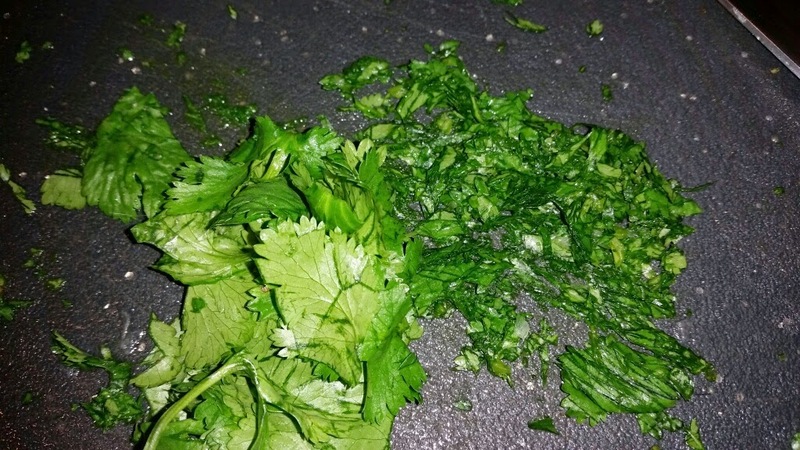 I soon figured out that it had cilantro, something that wasn't common in the Arizona Mex I had grown up with. I've come to like it a lot, but it's certainly optional if you're one of the many to whom it tastes like soap. Add more salt, 1/4 tsp or more to taste, and the juice of 1/2 to 1 lemon or lime. You might need even more, depending on the fruit. See what tastes right to you. I got super lucky this week and a friend brought me this gorgeous Meyer lemon from her tree, so I just had to share a pic even though you know what a lemon looks like. Hang on to the squeezed lemon half - you'll have a practical use for it later. You could make a separate guacamole, and sometimes I do, but I find it simpler to add diced avocado to the fresh salsa. Take each half of one ripe avocado and slice crosswise and lengthwise until you have lots of little squares. Then push up on the back of the peel to pop the pieces out, helping the ones that stay in with a paring knife. 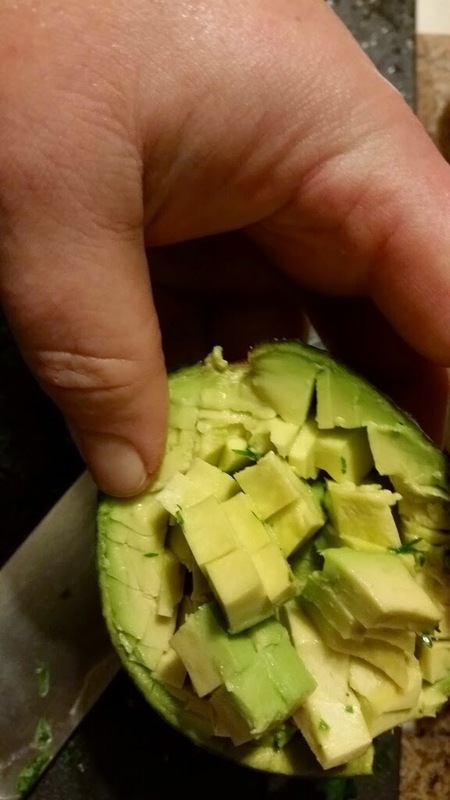 Note: a ripe avocado is soft, but not too soft. Try to find one with the stem still intact as it will be less likely to be brown inside. If you're totally lost once you're in front of the avocados at the market, ask someone for help! Add the avocado to the bowl, give it a good stir, and taste again for salt and lemon. Cover with plastic wrap and set in the fridge while you make the beans. Next, make the refried beans. I prefer pintos, but black beans would be good, too. 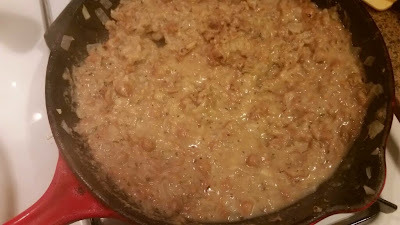 You could buy a can of refried beans and heat it up, or you could spend a long time cooking beans from dried, but for this kind of dish I usually split the difference and "re-fry" canned pintos. Leftovers are great for snack dips, or for breakfast with a fried or poached egg. Open two cans of pinto beans. Drain and rinse the beans well. Chop a medium onion or 2/3 of a large onion. 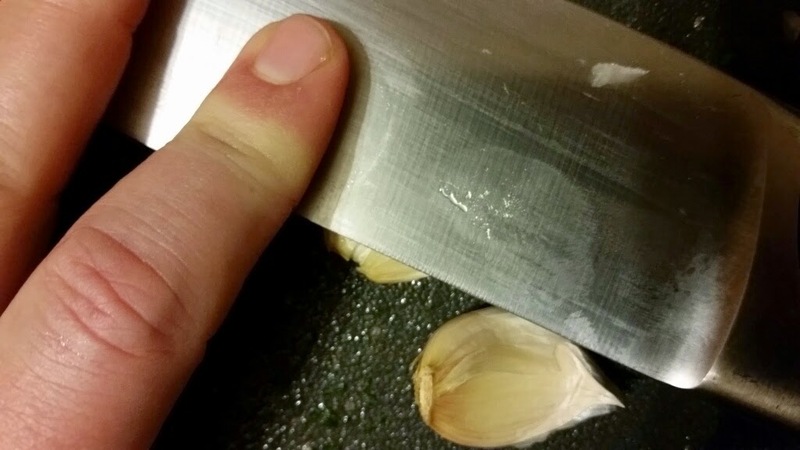 Smash 2-3 cloves of garlic, peel them and mince them finely with a knife or a garlic press. If you want to shave off a few more minutes, you can even grate the onion. I've been known to do this on a weeknight when I've gotten home late. 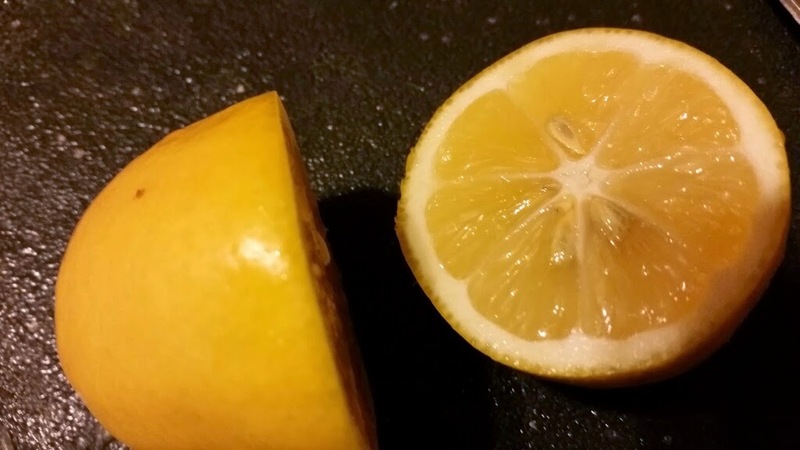 Here is where you get to use the squeezed lemon: when you're done with the garlic, rub the spent lemon on your fingers, knife and cutting board to get rid of the smell. It's all about re-use and re-purposing, right? Add 2 Tbsp flavorless or mild flavored oil (Canola, Grapeseed or Corn oil will do) to a large skillet. Add the chopped onion and saute over medium heat for a minute or two. Move to the side to make a "hot spot" for the garlic. Saute another minute, just until you can smell the garlic, and then mix the garlic into the onions and keep cooking. Saute a few more minutes until the onions are translucent, being careful not to let them brown. While the onions cook, grate 8 oz of mild cheddar, Monterey Jack or Colby cheese. Or more if you want to gild the lily. It's a special occasion, after all. You can, of course, use pre-grated cheese, but you can get better quality for your money if you get a small block and grate it yourself. Pre-heat your oven or broiler (oven to 350 or broiler to broil). 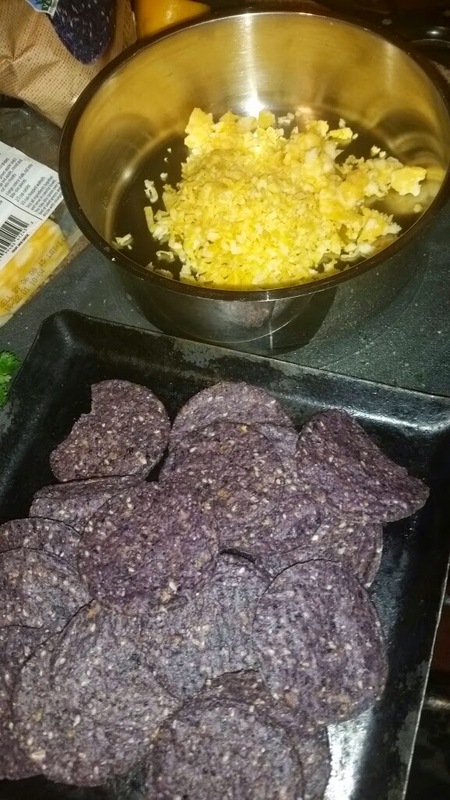 Put a layer (not a pile) of tortilla chips (about half of a 16 oz bag) on a baking sheet or in a 9"x13" baking pan. The ones in the photo are Sesame Blues, my personal favorites. When the onions are translucent, add a pinch of salt to them. Then add the rinsed beans, 1 tsp of chili powder, 1/2 tsp of cumin (or 1 tsp of cumin and a pinch of Mexican oregano if you can't do chilies like me), and a touch of water or broth. When heated through, add another pinch of salt and a couple of pinches of black pepper. Start mashing with a potato masher or stick blender (my stick came in really handy when I was cooking for a giant house full of students back in college). If they look like this photo on the left, they're about to start scorching. 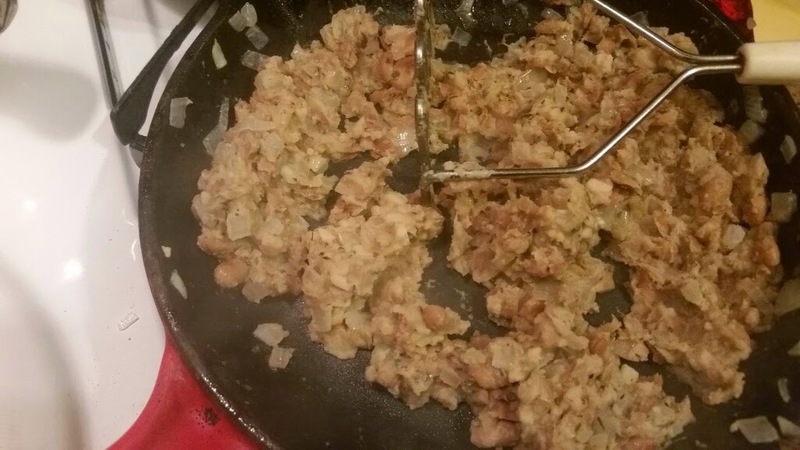 Add water a touch at a time so they always look just a little "simmery" like in the photo below, but not soupy. They'll dry up when you turn off the heat. I kind of like chunky beans, but mash or blend until they're as smooth or chunky as you like, tasting for salt and spices, adding more flavor and/or water if needed. Turn off the heat. Put a little more than half the beans and half the cheese on the chips. Make another layer with the rest of the chips, beans and cheese. If you're using the broiler, put the pan under the pre-heated broiler for 1-5 minutes, keeping a close eye on it. Remove when the cheese is melty and bubbly. If you're using the oven, put the pan in the pre-heated oven for 15-20 minutes until the cheese is melty and bubbly. After removing the pan from the oven, take the pico de gallo from the fridge and spoon as much as you like over the nachos. Chop 2-3 scallions and sprinkle those on top. Add some little spoonfuls of sour cream if you like. Use any leftover pico de gallo to top quesadillas or eggs the next day. If you're using a baking sheet, slide the nachos onto a large plate to serve. Let everyone dig in! If you're using a baking pan with sides, you can cut them into servings with a metal spatula and serve onto individual plates. Enjoy!